LONDON— Inspired by audience reaction at gigs and some new recording dates, the 12 tracks that come together on Sister Suzie’s AIN’T NO LADY include a handful of finely tuned, self-penned compositions and pay tribute to the blues stars that have influenced her sound—Elmore James, Jimmy Rogers, Big Mama Thornton—and significantly, Irma Thomas. “I have a love of all of the women in music from the southern states of America, especially pre-1960 whom, despite everything life would throw at them, moaned the blues and commanded respect in their lyric, sang the nuances of every line. There's something powerful about that that gets me and tugs at my heart. Irma has a particular depth and tone in her voice. I love how she uses it to convey the stories she is telling with pure emotion,” says Suzie (Susan Clarke). Sister Suzie was born and raised in Longhoughton, a tiny village in north Northumberland near the town of Alnwick, UK. She got her start as if by chance. “One day the guy who ran our local establishment asked me if I'd like to do a show, and not long after, I was asked to sing in a newly formed rock band. I jumped at the chance. My guitarist at that time was Dale Robinson, who opened my ears and heart to the sounds of Rufus Thomas and old blues roots music, and my life hasn't been the same since. It was soon after that I wound up in New Orleans seeking the music I had not long found that made my blood rush,” says Suzie. That experience marked the beginning of a new path that found a solid footing in this first set of recordings. The singer gravitated to East London’s Gizzard Studio for its analogue feel. “I wanted the first album I made to be cut onto tape and sound like all of my favourite records—recorded live on old machines with a great engineer—and that’s exactly what we did!” Suzie says. Sister Suzie appears on these recordings with her regular touring outfit, The Right Band, featuring Matt Jackson on guitar, Eddie Edwards on double bass and Brian Nevill on Drums, further augmented by a hand-picked gang of sax players from the UK’s finest. 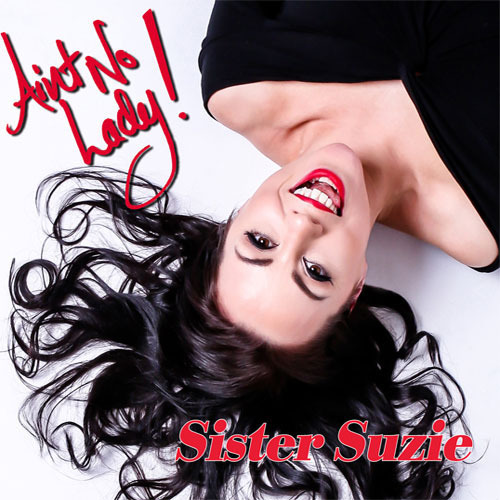 The resultant AIN’T NO LADY perfectly captures the soulful vocalising and magnetic stage presence Sister Suzie and The Right Band take to new heights with every exciting live performance. The album is scheduled for release 31 August.